Are you suffering from a herniated disc? Chronic low back or leg pain? Sciatica? Flexion Distraction Therapy may be the right treatment for you! 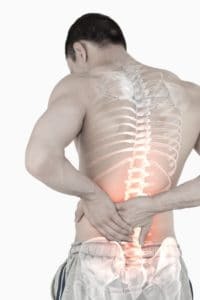 Flexion Distraction is an advanced, traction based therapy commonly used to manage the symptoms of lumbar disc injuries, and various other low back complaints with great success. It is a safe, gentle, and nonsurgical therapeutic procedure. It involves the use of a specialized table that simultaneously distracts (stretches) and flexes the spine in a gentle cyclical motion. This motion allows compressed disc spaces to increase, reducing the pressure inside the disc and allows the gelatinous disc that has been absorbing the force of gravity for your spine to spread out and fill up with fluid. The flexion movement of intervertebral joints allows your body to produce more lubricating joint fluid between the disc spaces. This helps to reduce pressure on the spinal cord and spinal nerves ultimately improving spinal structure, increasing range of motion and reducing pain. Along with the movement of the table, a chiropractor will apply gentle pressure to specific areas of contact with the intention to stretch the spine, warm up low back muscles, relieve pain, and restore motion to the spine. It is a noninvasive and effective approach for disc injuries, low back, and leg pain symptoms, and is a viable alternative to explore if spinal surgery has been recommended. Dr. Massey has had great success using flexion distraction therapy on many patients, saving them from further medical intervention such as surgery and/or injections. Contact us today to learn if this therapy may help you.